. This story should not be confused with the Stern/Frenz mini series entitled Revenge of the Green Goblin. It does not explicitly state anywhere in the book that it should be considered part of the 616 Universe (whereas the Goblin Moon story gave specific details as to where it fit in the 616 timeline). However, there's also nothing featured in this story that directly contradicts established 616 canon and since there's history between the Chameleon and the Green Goblin this story can actually fit. The story begins immediately following the events of a different Spider-Man novel by Dean Wesley Smith called Carnage in New York. Spider-Man had defeated Carnage and was now in possession of a deadly serum, which was developed by the recently deceased Dr. Eric Catrall. If exposed to the serum people would be driven violently insane and unleash...well, carnage! Spidey knew exactly what to do with the serum, take it to the Fantastic Four. He gives it to Reed Richards and asks him to store it safely in his lab at Four Freedom's Plaza. Mr. Fantastic agrees to hold on to the contagion but he's soon attacked by a mysterious figure armed with pumpkin bombs who absconds with the deadly serum. This mysterious figure had managed to gain access to one of the few Goblin Hideouts that both Harry Osborn and Roderick Kingsley failed to find. As it turns out, this mystery character had learned of this hideout from a set of files he found on an old computer at the destroyed Kravinoff Mansion. The files on that computer provided the mysterious figure with information on Spider-Man and the original Green Goblin. As an aside, it appears as though the files contained the identity of the original Green Goblin but not Spidey's civilian identity. That'll be important later on in this section. Nevertheless, the figure clearly has a vendetta against Spider-Man and wishes to do him harm as retribution for the death of Kraven the Hunter. 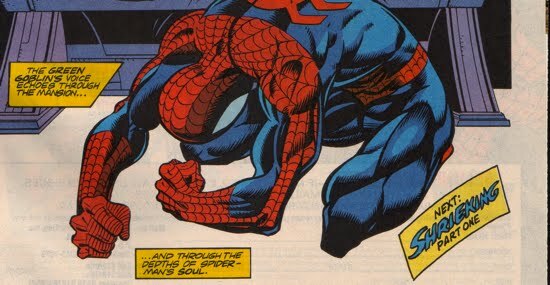 The figure did not want to simply kill Spider-Man, he wanted him to suffer first! Gaining access to the undisturbed Goblin Hideout was the first step of his plan, since he knew that the Green Goblin was Spider-Man's biggest tormenter! This mysterious figure then arranges Carnage's escape from the Vault and the murderous symbiote goes on a rampage as he makes his way from Colorado to New York City. Meanwhile, the mysterious-Goblin-Hideout raiding antagonist parades around New York City disguised as Norman Osborn. Spider-Man thinks he's seeing ghosts when he sees Norman Osborn walking down the street but when he tries to follow him, Osborn seems to disappear into the wind. A few days later this "Norman Osborn" arranges for Mary Jane, Flash Thompson and Liz Allan Osborn to meet and he takes the opportunity to abduct them. Then, after donning the Goblin attire, the mysterious figure takes MJ to the infamous Brooklyn Bridge. Quick aside, Harry Osborn had taken MJ to the Brooklyn Bridge when he kidnapped her in Spectacular Spider-Man #199-200. Another quick aside, MJ would later be taken by the real Norman Osborn to the George Washington bridge during the Sinister Twelve storyline. Spider-Man makes his way to the bridge and an all-out brawl breaks out between the wall crawler, the mysterious New Goblin and his new ally Carnage. Spidey is successful in defeating both Carnage and the Green Goblin. In fact, he's also able to unmask this Goblin imposter to find The Chameleon under the mask! That's right, Dmitri Smerdyakov had infiltrated a secret Goblin Hideout and took on the mantle of the Green Goblin...all in an effort to destroy Spider-Man. Eventually Spidey regains control of the serum and all is right with the world. As stated earlier, there's no blatant contradiction of 616 canon in this story so there's no reason to think it should be excluded from the established dogma. 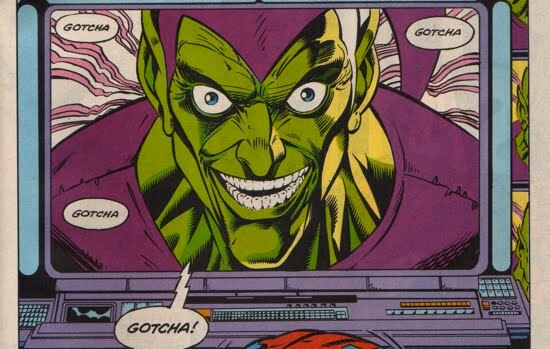 And given The Chameleon's history with the Green Goblin, this actually fits quite well. Recall that one of Harry's many posthumous attacks on Peter was the creation of the faux-Parkers, simulcra-based human constructs used to imposter Richard and Mary Parker. In order to execute on that plan Harry used Smerdyakov as an instrument to carry out the mission. It wasn't until Spider-Man had defeated and humiliated The Chameleon (at the Kravinoff Mansion nonetheless!) that he discovered it was Harry who actually orchestrated the whole thing (featured in Amazing Spider-Man #389). The Chameleon was pyschologically destroyed after that event, he was shape-shifting himself into Kraven with delusions of grandeur then eventually referring to himself as being nobody as he wallowed in his own misery. The Goblin's Revenge novel takes place after Harry's faux-parents plot agains Peter. The Chameleon could very well have eventually put himself back together (literally) and searched the Kravinoff Mansion to find this computer that led him to Norman's unknown Goblin Hideout. 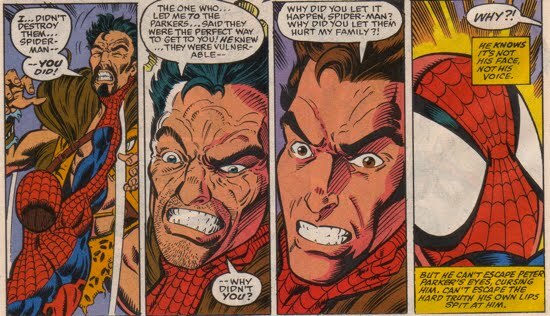 Since Harry had used him so blatantly and since Norman had done the same to Kraven the Hunter, then it would make sense that Smerdyakov would have had a vendetta against the Green Goblin. We also know that throughout this novel The Chameleon never found out Spider-Man's civilian identity. Which also holds with established canon because we know that he does not find that out until Spectacular Spider-Man #243. 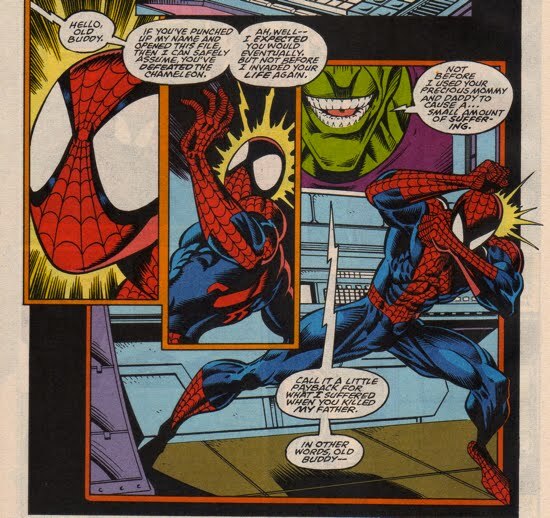 Interestingly, to demonstrate that even continuity between comic books is not all that easy, the notion that Norman Osborn had told Smerdyakov that Peter was Spider-Man was proposed in Sensational Spider-Man (Vol. 2) #30 (see panel to the right). So continuity is not that air-tight anyway, which is why including this novel as 616 canon seems worthwhile. 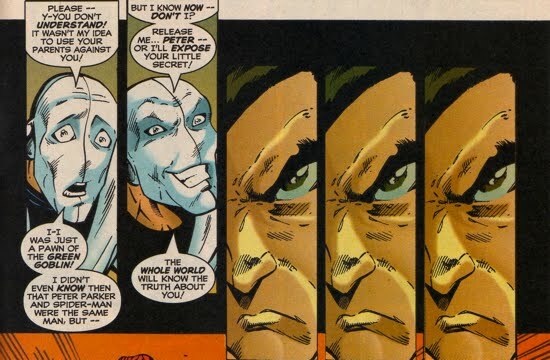 Bottom line, the idea of Smerdyakov using his Chameleon-skills to impersonate Norman Osborn and The Green Goblin in an effort to drive Spider-Man mad is perfectly fitting.